The sun, planets and angels and the firmament. Woodcut dated 1475. Then God said, “Let there be a firmament in the midst of the waters, and let it divide the waters from the waters.” Thus God made the firmament, and divided the waters which were under the firmament from the waters which were above the firmament; and it was so. And God called the firmament Heaven. So the evening and the morning were the second day. The word "firmament" is first recorded in a Middle English narrative based on scripture dated 1250. It later appeared in the King James Bible. The word is anglicised from Latin firmamentum, used in the Vulgate (4th century). This in turn is derived from the Latin root firmus, a cognate with "firm". The word is a Latinization of the Greek stereōma, which appears in the Septuagint (c. 200 BCE). 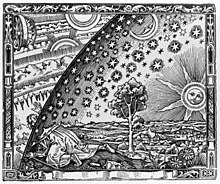 The Flammarion engraving (1888) depicts a man crawling under the edge of the sky, depicted as if it were a solid hemisphere, to look at the mysterious Empyrean beyond. The caption underneath the engraving (not shown here) translates to "A medieval missionary tells that he has found the point where heaven and Earth meet..."
The word "firmament" is used to translate rāqîaʿ (רָקִ֫יעַ), a word used in Biblical Hebrew. It is derived from the root raqqəʿ (רָקַע), meaning "to beat or spread out thinly", e.g., the process of making a dish by hammering thin a lump of metal. The Hebrews regarded the earth as a plain or a hill figured like a hemisphere, swimming on water. Over this is arched the solid vault of heaven. To this vault are fastened the lights, the stars. So slight is this elevation that birds may rise to it and fly along its expanse. A detailed Christian view of the universe, based on various Biblical texts and earlier theories by Theophilus of Antioch and Clement of Alexandria, was formulated by the 6th century Egyptian monk, Cosmas Indicopleustes. He described a flat rectangular world surrounded by four seas; at the far edges of the seas, four immense vertical walls supported a vaulted roof, the firmament, above which in a further vaulted space lived angels who moved the heavenly bodies and controlled rainfall from a vast cistern. Augustine wrote that too much learning had been expended on the nature of the firmament. "We may understand this name as given to indicate not it is motionless but that it is solid." he wrote. Saint Basil argued for a fluid firmament. According to St. Thomas Aquinas, the firmament had a "solid nature" and stood above a "region of fire, wherein all vapor must be consumed." The Copernican Revolution of the 16th century led to reconsideration of these matters. In 1554, John Calvin proposed that "firmament" be interpreted as clouds. "He who would learn astronomy and other recondite arts, let him go elsewhere," wrote Calvin. "As it became a theologian, [Moses] had to respect us rather than the stars," Calvin wrote. Calvin's doctrine of accommodation allowed Protestants to accept the findings of science without rejecting the authority of scripture. The Greeks and Stoics adopted a model of celestial spheres after the discovery of the spherical Earth in the 4th to 3rd centuries BCE. The Medieval Scholastics adopted a cosmology that fused the ideas of the Greek philosophers Aristotle and Ptolemy. This cosmology involved celestial orbs, nested concentrically inside one another, with the earth at the center. The outermost orb contained the stars and the term firmament was then transferred to this orb. There were seven inner orbs for the seven wanderers of the sky, and their ordering is preserved in the naming of the days of the week. Even Copernicus' heliocentric model included an outer sphere that held the stars (and by having the earth rotate daily on its axis it allowed the firmament to be completely stationary). Tycho Brahe's studies of the nova of 1572 and the Comet of 1577 were the first major challenges to the idea that orbs existed as solid, incorruptible, material objects. In 1584, Giordano Bruno proposed a cosmology without firmament: an infinite universe in which the stars are actually suns with their own planetary systems. After Galileo began using a telescope to examine the sky, it became harder to argue that the heavens were perfect, as Aristotelian philosophy required. By 1630, the concept of solid orbs was no longer dominant. ^ a b Herbermann, Charles, ed. (1913). "Firmament" . Catholic Encyclopedia. New York: Robert Appleton Company. ^ "And God said, Let there be a firmament in the midst of the waters, and let it divide the waters from the waters" "Genesis 1:6". ^ "firmament", Oxford English Dictionary (1989). "ðo god bad ben ðe firmament". From The story of Genesis and Exodus (1250). ^ a b c "Online Etymology Dictionary – Firmament". ^ "Lexicon Results Strong's H7549 – raqiya`". Blue Letter Bible. Blue Letter Bible. Retrieved 2009-12-04. ^ Seely, Paul H. (1991). "The Firmament and the Water Above" (PDF). Westminster Theological Journal. 53: 227–40. Retrieved 2010-02-02. ^ "Cosmogony". JewishEncyclopedia.com. Retrieved 2014-05-15. ^ White, Andrew Dickson (1896). A History of the Warfare of Science with Theology in Christendom: Volume 1. New York: D. Appleton and Company. pp. 91–92. ^ a b c Grant, Edward, Planets, stars, and orbs: the medieval cosmos, 1200–1687. p. 335. ^ Saint Thomas Aquinas, Summa Theologica, "Whether there are waters above the firmament?" ^ Giordano Bruno, De l'infinito universo e mondi (On the Infinite Universe and Worlds), 1584. Look up firmament in Wiktionary, the free dictionary. Wikisource has the text of the 1911 Encyclopædia Britannica article Firmament. Denver Radio / YouTube Debate on the Firmament between well-known creationist and atheist opponents.